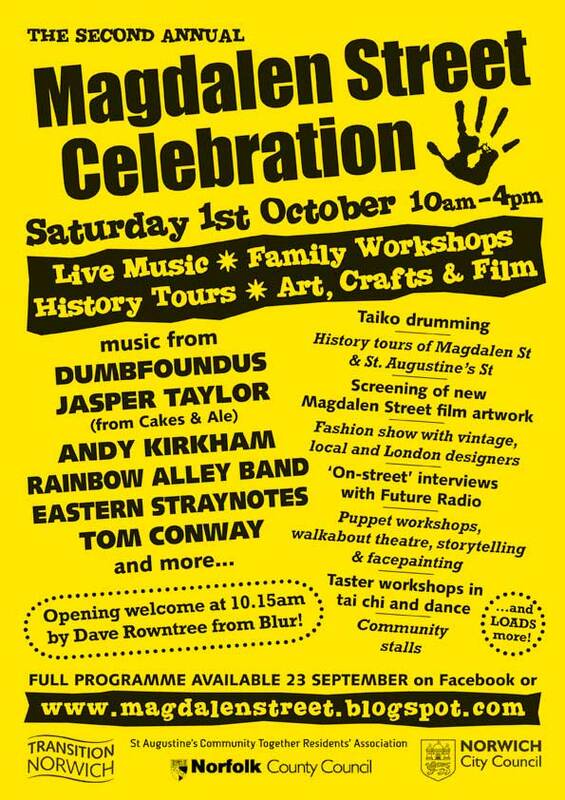 On Saturday October 1st, Magdalen Street will celebrate its unique character in street festival style with performances, exhibitions, fashion shows, workshops, family activities and local history tours. Following on last year's memorable and groundbreaking success, even more musicians and activities have been arranged. Norwich Taiko Centre will be opening the event under the Magdalen flyover and some of the best-known bands in the city will be playing on the street throughout the day, using a cycle-powered PA. The audience will be able to hop on the bike and power up their favourite bands! The art events, stallholders and historical aspects to the day will bring to life Magdalen Street's rich heritage. The street still boasts a range of food, clothes and shoe shops and is classified by the City Council as the busiest in the whole of Norwich for numbers of pedestrians and buses. Some of the shops from 1905 have survived - most notably 2 of the original fish shops. 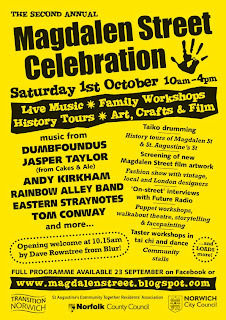 The Magdalen Street Celebration themes for 2011 are Creativity, Diversity and Sustainability. Known informally as the 'Creative Quarter', the area houses a multitude of creative businesses. 'Diversity' refers to the street’s ethnic diversity as well as the range of disability-related charities operating in the area and 'Sustainability' is represented by the plethora of second-hand, vintage, antique and craft shops in the area.